The modern era has provided corporations with a range of blessings. Who doesn’t like the convenience of managing payroll with just a few clicks? That said, it has also exposed organizations to previously unseen threats, like identify theft. Online, you can count on two-factor security, anti-spam software, and other identify theft solutions to keep your enterprise safe from adversaries. But what steps can you take in the practical world, where you’re continuously storing bank passwords, unsolicited credit card statements, and contract drafts on paper? In an ideal world, you get a document shredder. While there are several document shredders out there, a high powered one affords company owners safety, and prevents leaks of customer information, sensitive data, and other confidential details. Capacity to shred: Check the shredding capacity of the shredder before you make an investment. Many high powered document shredders can cut from 16-50 sheets of paper in a single go. If you have lots of materials or paper work that you want to dispose, it is worth spending on equipment with bigger shredding capacity. Bin size: It is important to gauge the bin capacity before getting a document shredder. 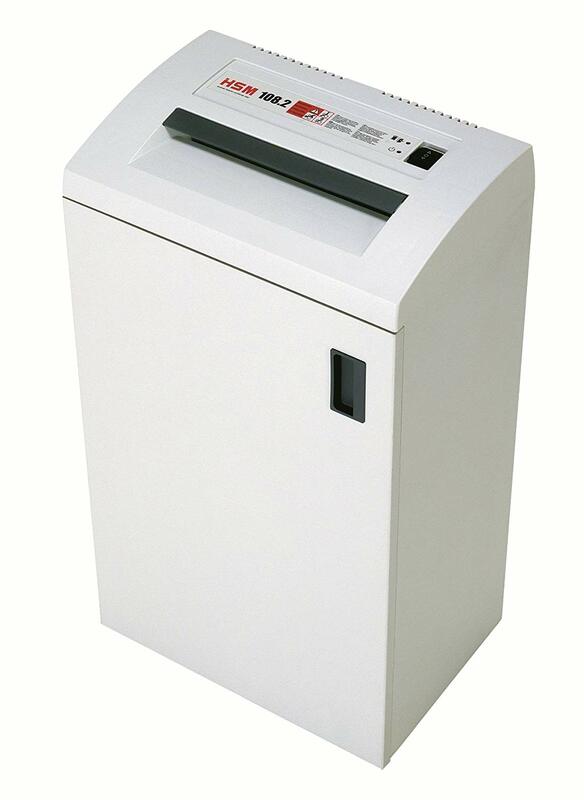 Most high powered shredders come with a 16 to 25-gallon waste storage basket/bin. As mentioned earlier, if you have piles of documents to shred, it is not going to be convenient with a small bin, so it’s best to seek a shredder that has a large enough bin capacity. Run & Cool time: Most models of high powered shredders can function for 15-20 minutes before requiring a break, though a few can go on for 60 minutes constantly before requiring a cool down. The best high powered shredders will have a decent enough run time to shred a big quantity of CDs, DVDs, credit cards, papers, and other waste in a single go. Security: Lastly, look at the security while making a buying decision. The tinier the pieces the shredder is able to produce, the more secure your organization’s confidential information will be. Cross cut and micro cut shredders are better than strip cuts, as the latter can be reproduced with special applications. This high powered shredder comes from the AmazonBasics line. It can shred up to 24 pages in a go and can also make ID cards useless. The papers are shredded into 7/32 inch by 1-27/32 inch particles. The shredder also contains LED indicators that remove a bit of the guessing that comes with typical troubleshoots, revealing common red flags like overload, open door and overhead. Additionally, there is an auto reverse function that keeps paper jams at bay. The run time of the shredder is 25 minutes, and then it requires a 60-minute cool down period. In addition to paper, the shredder can cut Blu Rays, DVDs, and CDs into small pieces. Even credit cards are reshaped into tiny pieces, which renders them useless. This is a 2-sheet cross cut shredder that is 100 percent jam proof and is ideal or commercial use. It allows users to shred up to 45 minutes without having to clear the shredder’s blade. An additional dose of safety is also integrated with SafeSense technology. Additionally, the shredder has a 14-gallon waste basket, and delivers quiet performance regardless of how long you use it for. A standout feature is its 45 minute run time, after which it requires a cool down period. Fellowes 125Ci can easily shred credit cards and CDs and still function without jams. Fellowes 125Ci is equipped with SafeSense technology. It makes sure the shredding stops when the user’s hands touch the opening of the paper. Bonsaii is an impressive high powered document shredder that will impress most office users. It can function up to an hour constantly, and require just a 10-minute cool down period before it does another shred. Bonsaii EverShred can destroy 18 sheets of paper in a single go, cross cutting paper that are ¼ inch x 1-23/50 inch in size. Similar to all other heavy duty shredders, it can shred CDs, credit cards, DVDs, and documents that come with staples. The Automatic Jam Protection makes sure it goes back in reverse mode when needed. Lastly, it has a 6 gallons capacity wastebasket that can be pulled out for simple, less frequent emptying, and its transparent window ensures when it is full. The noise level of 62 dB low. This means users get a smooth and quiet shredding experience. Additionally, there are 4 Casters that make it convenient to move the shredder wherever you want. HSM Classic is one of the oldest shredders out there. It comes with a 13-gallon bin for easy waste management, and is capable of shredding through 384 sheets of (paper per minute). It can also strip-cut 38 particles per page. Additional things that can be shredded include CDs, DVDs, paper clips, and shred staples. Constant Duty Operation makes sure you can keep shredding without down time. Zero Energy (stand-by) makes sure that no power is consumed in “stand by mode.” Moreover, the solid steel cutting cylinder has been designed with solid steel construction for on-off switch, automatic start/stop and high cutting capabilities for high-end reverse functioning. The vendor even goes as far as to offer disposal plastic bags (optional) that snug easily into the waste container and makes cleaning up a breeze. Its 13-gallon waste bin is protected by a door that keeps users’ office tidy and ensures particles and dust from air don’t enter the shredder. That concludes our list of high powered document shredders. Hopefully by now, you’ve discovered the assistant for your premises that will keep your confidential data safe for long. With these shredders, you should be able to eliminate your unwanted files without investing in external storage or exhausting yourself.